…but it will be much more fun to make Scones along with the Inspirational and Imaginative iScone Team! Come on, join in…. round scones, square scones, wedge shaped scones, savoury, sweet, citrussy, chocolatey, gluten free scones, small scones, tall scones, leaning tower of Pisa scones, hockey pucks, scones for Poodles… no excuses. Make the scones, fill the kettle, dust the teapot off, invite a mate around… or eat them all yourself, either way just do it! The perfect accompaniment to #OperationCupofTea if you are a Twitter fan too. Pour out the tea for it’s our special Scone Week! My scones were made with home made ricotta, following Brydie’s expert guidance here, and my own yoghurt. 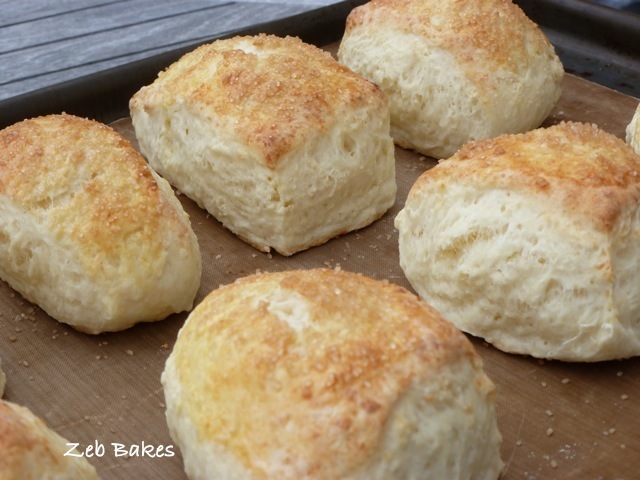 I used very little sweet butter and sugar and still the scones were light and delicious. Go on treat yourself. I’ll post the recipe on a second post in case anyone wants it. Any other Alphabetters in August fancy joining in? I really had to think for a moment then :D tease? Moi? And then I remembered the excerpt that I put on the email thingy. 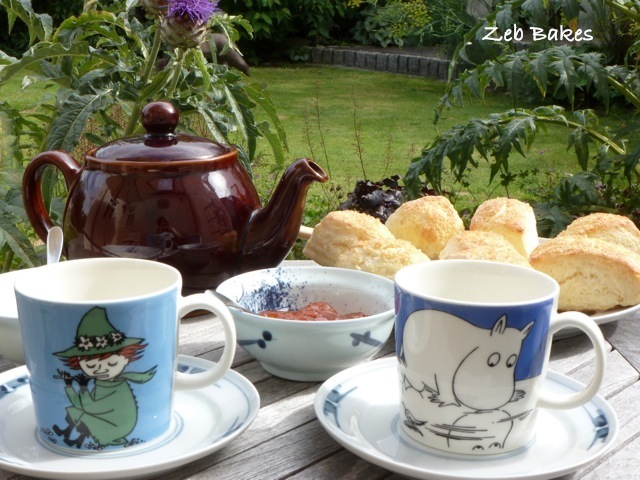 The Moomin mugs are great because apart from being covered in Moomins they are not too tall and I can fit them in a drawer in the kitchen and they like visiting the blog. Oh you are clever, I was wondering how you were going to work scone week into the alphabet meme!! Those are stunning beautiful, Joanna, and I would be pleased to share a cup of tea and a scone with you anywhere and at any time. I’ll look forward to seeing the recipe. 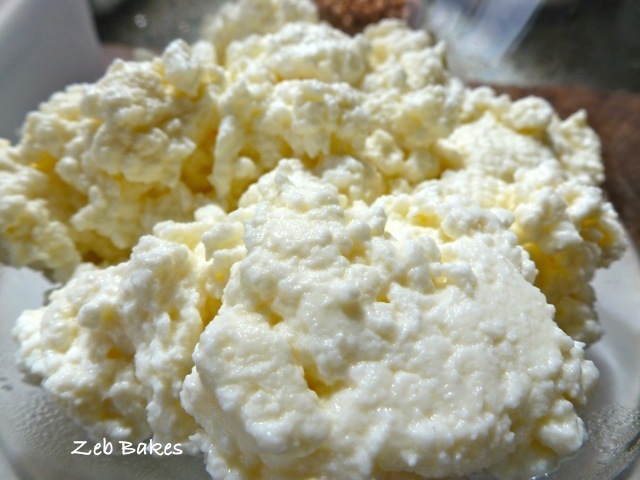 Look at your lovely ricotta! It looks superb. Maybe I should make some scones with ricotta as well. I made some Vanilla Maple ones yesterday, but they seem to have disappeared before a photo was taken. But I’m with the scone team in spirit! Those Moomin cups really are sweet. I, too, love your Moomin mugs and all the rest of your setting! I hope you’re having a lovely break by the seaside Jan ! Thanks for commenting. I posted some late night pictures when a Twitter friend tweeted about #operationcupoftea. http://yfrog.com/hsb32ixj. I am on Twitter as Zeb_Bakes. We are all very subdued here, watching our TVs, not going out, cities under voluntary curfews, vigilantism, it changes day by day and there are so many troubles in the wider world that are not getting our attention as a result. It was a toss up yesterday between cheese and bacon scones and these very plain ones. Brian said “Plain” If asked, he always chooses the simplest option for everything. But I do adore cheese scones too…. maybe I will make a batch today and throw some chives into the mix – lovely suggestion! Interesting that Brian also likes the plain ones. I love your cheese and bacon quick bread recipe, but Peder will take ‘plain’ bread any day. Same goes for my scones. I asked what he’d like, and he wanted plain. Men, eh? I made meatloaf for dinner; Peder was in heaven. He likes plain food. He often says that he’s a plain guy, which I think is so untrue. Right now, he’s finishing off Sedrick’s first sourdough (mini) boule with cheese and my Forest Berry jam. The bread is tasty but not sour enough yet. Couldn’t bring myself to throw out the 3/4 today, so made bread with it. 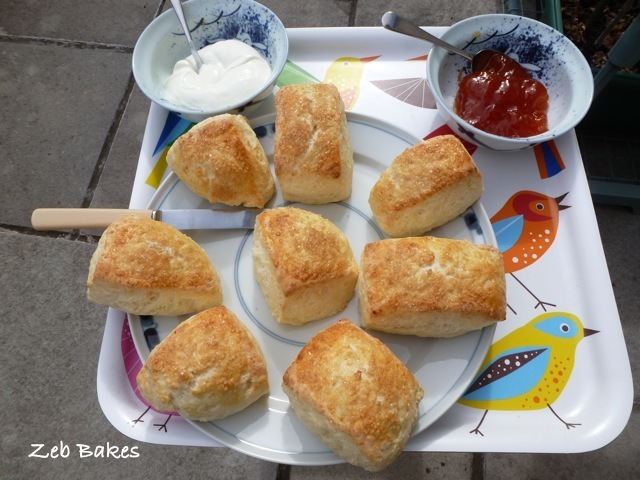 What fun, rectangular scones, tea in the garden and a scone poem to mark the occasion. It’s interesting to see a picture of the ricotta too – must give it a go. Hi Choclette, I’m glad you found this fun! I felt very silly when I was writing it. The ricotta seemed to thicken into bigger bits once it had cooled down, when it was first coagulating I wasn’t really convinced at all. I would like to try using lemon juice instead of vinegar and see how that goes. Carl (on Twitter) says that true ricotta is made by cooking whey and gave me a useful reference for this on Wiki and reminded me that ri-cotta means – twice cooked. All these twice cooked words bis-cuit is another one of course. I adore scones but I can’t say I’ve ever attempted to make them (I’ve never baked anything in my life) but they look so delicious that I just might give it a go. It can’t be that hard can it? ‘ Morning rivertems ! Thanks for coming back ! like anything it takes a little practice. I think my first scones were pretty rubbish to be honest. I didn’t bake for many years, it’s only since I started doing the bread thing and latterly writing this blog that I have taken more of an interest in cooking generally. The only problem people seem to have is that they complain they get heavy scones, I think that’s to do with overmixing and fiddling about with the dough too much and also not overcooking them. They carry on cooking when they are out of the oven as they cool. No, keep reminding me. I need it, as I definitely want to make scones this week. Beautiful scones. Love the little table set for your tea time with scones. Beautiful view. It was a bit more relaxed in my household this time last year when we did this together, how time flies! Your scones look smashing. I made pumpkin scones to keep in the International theme. Pumpkins scones are very big in Australia.